Prior to the G20 Trump had gone to Poland, offering a US-Polish trade deal (which is precluded by Poland’s membership of the EU), praising its anti-immigrant government and complaining that Germany exports too many cars to the US and could face tariffs. His major speech prior to the summit was a ‘clash of civilisations’ rallying cry for what he describes as the West having to unite against its enemies. He also threatened sanctions and unspecified ‘severe measures’ against China and North Korea respectively after the latter’s successful missile launch. The overall programme put forward was one of a faltering US; attacking former allies, breaching previous agreements, appealing only for more war in the Middle East, pursuing aggression in the Pacific and opposing the tackling of climate change. It is no accident that both China and the German leadership in the EU are under attack from Trump. This reflects both US continuing economic weakness and the imperative to claim more of the world’s savings to finance greater US expansion. China and Germany are the two countries in the world with the largest net savings. In contrast to the US, Chinese President Xi Jinping arrived at the summit having established an $11bn joint investment fund with Russia, important progress on gas pipelines in both Russia and Iran, and a $20bn agreement with the European Airbus consortium to purchase aircraft. Xi Jinping allied with German Chancellor Merkel in defence of free trade and against protectionism, and in defence of the Paris agreement on climate change, which was warmly welcomed in the German press. The EU itself is becoming an increasingly important actor globally, as its economy improves. The EU-Japan free trade deal will reduce barriers. 600,000 jobs in Europe depend directly on EU exports to Japan and these are projected to rise significantly following the agreement (pdf). On the Paris Agreement, the final communique (pdf) pointedly noted the US decision to withdraw and yet maintained that, “The Leaders of the other G20 members state that the Paris Agreement is irreversible.” The world will increasingly look outside the US for leadership on this decisive question, including US cities, state governors as well as some companies. Globally public opinion has turned sharply against the US and its President since Trump’s election victory. Research company Pew reports net approval ratings for the US plunge from +38 under Obama to just +10, and Trump’s personal rating is -52 compared to Obama’s +41. In individual nations public opinion tends to reflect the government’s views. The biggest deterioration of opinions about the US has taken place in European countries and in South Korea. Unsurprisingly, the lowest absolute rating is in Mexico, where just 5 per cent of the population has a favourable rating of Trump. Trump stands against the interests of all humanity; on climate change, on racism, war and on prosperity with his threats of protectionism. He wants to unite with Saudi Arabia and Israel for more war in the Middle East. Merkel and Xi Jinping want unity on tackling climate change and in defence of freer trade. 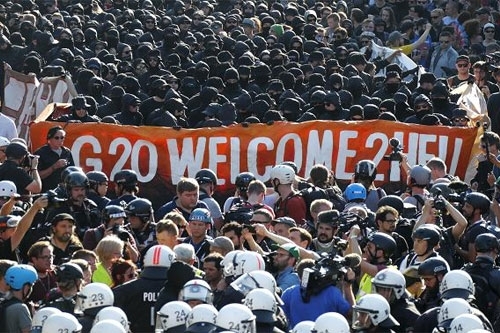 This was the message from the G20.